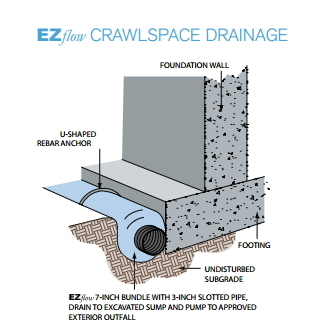 Southeastern Home Solutions is proud to use EZflow™ drain products for their crawlspace waterproofing needs. EZflow™ is a gravel-free alternative to a traditional French Drain system. It works great in crawl spaces with standing water! The EZflow™ products are the industry leading crawlspace water management applications. 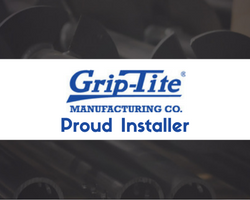 The drainage system is constructed of lightweight material, easy to use, and environmentally safe. Residential customers enjoy the fact that the EZflow™ is a complete packed drainage system and does not require the large, cumbersome gravel that other drainage systems require. This is beneficial to the client by lowering the cost of labor, because there are no more hassles of transporting gravel via wheelbarrow to trenches. It also allows for the construction site to remain more visually appealing by eliminating the large piles of gravel. Contact Southeastern Home Solutions today to find out more about the excellent line of products from EZflow™ Drain that is perfect for homes in Birmingham, Chattanooga, Huntsville, and the surrounding area.